Within the game you take on a 100 person Battle Royale against other online players. You're in a closed-in arena where there can only be one man standing at the end. In order to play, you'll need to move around each scene to pick up the resources you need to win -- including weapons, and much more. But that's not all. The arena itself as a battleground gets smaller and smaller with each passing minute. 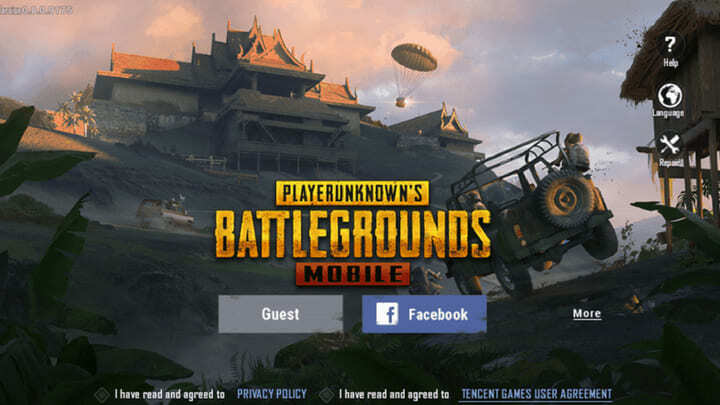 Pretty much all of the original elements found in the PC version of PUBG are to be found on its smartphone edition. Control systems keep in line with the original version, as well as scattered items and other interactive game elements found in each scene. Plus you can still break into abandoned buildings, jump onto motorcycles, pop on your telescopic goggles, pick up first aid kits, scamper your way up walls, and much more. From the settings menu in the game you can customize and modify the level of graphic detail according to your preferences. That way your experience is adjustable so as to best fit your smartphone's capabilities. You can also toggle controles like when you're driving or hiking around on foot. PUBG MOBILE is a fantastic adaptation of the original PLAYERUNKNOWN'S BATTLEGROUNDS where you'll enjoy hours of play in several modes, whether you're going solo or tag teaming. An added bonus is that if you choose the team option, you get to livechat with your buddies in-game to coordinate your moves, via your smartphone's microphone. The new rainforest map “Sanhok” is open, players can choose the rainforest map to match in the map selection. Added “Season Archive” function, which can be accessed in the game season interface to view the data of previous seasons. Added the QBZ assault rifle, use 5.56mm bullets, randomly placed around Sanhok. Added a flare gun to signal a super airdrop. Can be summoned in the play zone, and a Bulletproof UAZ can be summoned outside the play zone, which will be in classic mode for a limited time. Duckbill muzzle for the S1897 and S12K, which greatly reduces the vertical spread of shotgun bullets and increases horizontal spread. Reduce the additive effect of the accessories on the lumbar spread. Adjusted the range of shotgun bullets, the bullets will be more densely distributed. The bullet can penetrate water and hit enemies under water, but the damage will be less. The M24 sniper rifle will be removed from the airdrop and will be randomly placed around the map, but the damage is balanced to 79. The negative effect of the light grip is removed, and the effect is to greatly improve the shooting stability and improve the recoil recovery. Optimized the performance of the red dot sight and the 8x scope. Added the ability to replace the optical sight pattern and color for the following sights: Red Dot Sight, Holographic Sight, and 2x Sight. Sensitivity for 3x Scopes and 6x Scopes can be adjusted. During the 6x Scope and 8x Scope zooming, the sensitivity will be dynamically adjusted according to the sensitivity of the different multiples of the scope set by the player. When using 8x Scope to 4x magnification, the sensitivity of the 4x scope setting is applied. 6x Scope and 8x Scope zoom performance optimization, has been consistent with end-game performance. Added the ability to view the list of spectators in the battle. Automatic picking settings, such as the number of bullets, the number of Medicine, the number of grenades, etc. Limited time clothing can now be decomposed, and the reward for decomposition is BP. Optimized the animation during decomposition. Optimized the display of the backpack menu. Modified the UI to increase the image display of yourself and teammates. Added the ability to throw apples on the spawn island. New players who enter the game, can go through a Boot Camp, and the rewards in the Boot Camp can be completed within 7 days. Existing players can also complete a Boot Camp mission after launching the game and will receive rewards upon completion. Fixed the problem that some vehicles are too prone to drift in some parts of the map. Fixed the problem where the UI is not refreshed in time. Fixed the problem that playing in FPP can cause you to see through walls. Fixed the problem that the range of movement of the character’s FOV is limited.